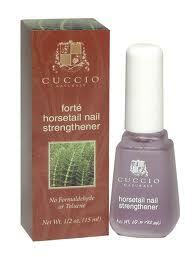 Cuccio Forte' Horsetail Nail Strengthener .5 oz. > Cuccio Forte' Horsetail Nail Strengthener .5 oz. The first nail strengthener to guarantee longer, stronger natural nails. Natural Botanical Horsetail grass gives the perfect amount of "nail flexibility" which prevents the problems of cracking and splitting. The active botanicals create a durable and protective bond with the natural nail surface. Use one to two times per week.